What is the ReFresh Program? 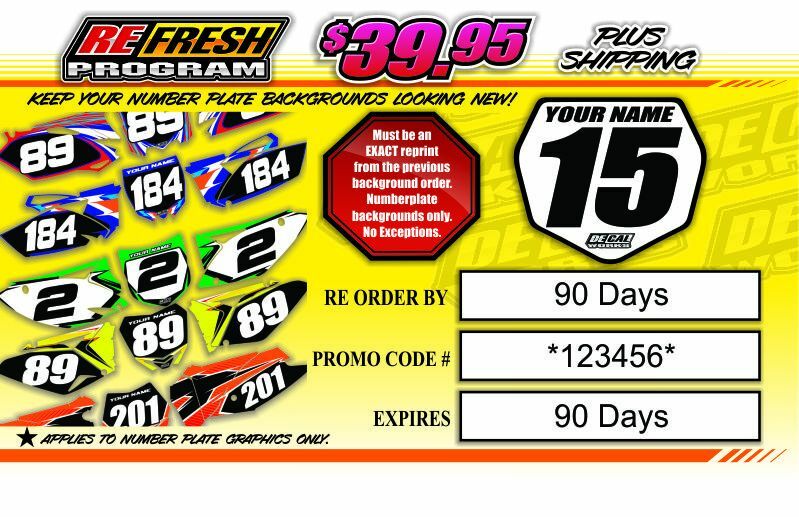 The ReFresh Program allows you to order an EXACT reprint of numberplate background DeCals for only $39.95 (plus shipping). 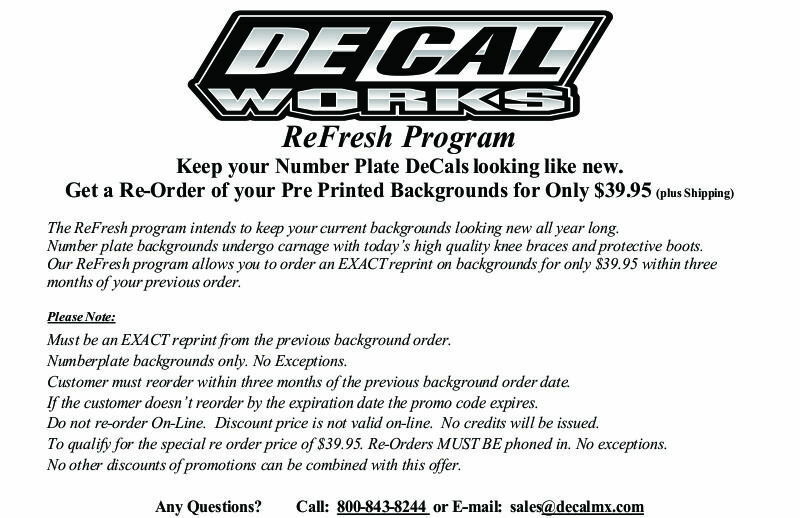 DeCal Works has innovated a cost effective program to keep your numberplate backgrounds looking fresh all year long. We are aware of the damage that today’s racing boots and knee braces cause to the decals even after just one ride. Our ReFresh Program intends to keep your numberplate DeCals looking new while racing on a budget. Once the original order for numberplate background DeCals has been submitted, the ReFresh Promo Code becomes available immediately and will last for 3 months. Customers may use the ReFresh Promo Code as many times as needed within the 3 months. Each time a new order is placed a new ReFresh Promo Code gets generated and the expiration date extends to 3 months from the time of purchase. I want everything the same except my race number. Exact reprints only. No exceptions. Any changes disqualify from ReFresh $39.95 price. Changes to colors, numbers, names, logos and bike models disqualify the promo code. I want everything the same except my background color. What if the promo code expires? Customer pays their normal price again and will qualify again on their next order. I didn’t know the ReFresh program existed will there be an exception? If the new order is placed after the expiration date or is not an exact reprint the customer will be charged their normal account price. What if I’m ordering a full kit & backgrounds, Can I still qualify? Only the Backgrounds would qualify for the ReFresh program. We currently do not offer a ReFresh program for full graphics kits. Can I submit a ReFresh order online? What if I submit an order online first, Will I still be credited for ReFresh pricing? There are no credits issued if the order is placed online. Do any other DeCals have a ReFresh option? Numberplate backgrounds only. No exceptions. Are Minis and Ultra Minis included in the $39.95 price? Yes. Background orders that originally included Ultra Mini and Mini Plates will print again. I Lost or Can’t Remember the Expiration Date on my Card? You will have to contact a sales representative and they can retrieve your expiration date. How long does the ReFresh promo last? The ReFresh Promo will last 90 days from the original date of purchase. What if it’s the same design and number but for a different bike? Must be an exact reprint as a previous order. Different models disqualify the exact reprint rule. What if I’m a support rider? Do I get a discount on the ReFresh kit? No. $39.95 is the price for all price levels.